​Found from Nova Scotia to South Carolina but are most abundant between Cape Cod and Delaware Bay. North of Cape Cod, the species generally remains close to shore in waters less than 60 feet. Can live in brackish water including some parts of the Chesapeake Bay. Can grow to 35.8 inches in length (Fishbase 2017). Can weigh up to 25 pounds (Fishbase 2017). ​Structure oriented fish, commonly found around reefs, rock piles, wrecks, and jetties. Juveniles found in submerged aquatic vegetation. ​Both males and females reach sexual maturity by age three or four. Spawning occurs in the Atlantic Ocean during May and June. Tautog can live up to 40 years (ASMFC, 2017). ​Keep the hook close to the bottom and the sinker on the bottom. Bait for tautog usually consist of crustaceans (rock crabs, fiddler crabs, sand fleas, etcetera). Patience is key as tautog will break into the crab slowly. Waiting for the second grab on the line has a better chance of hooking the tautog. ​The Maryland state and world record tautog weighed 28 lbs., 8 ounces and was caught off the coast of Ocean City, Maryland by Kenneth Westerfield in 2015. That fish was 23 years old. The oldest tautog aged in Maryland was 28 years old. Tautogs are known to exhibit inactiveness at night (ASMFC 2017). The Chesapeake Bay and Atlantic Coast Tautog Fishery Management Plan was adopted in 1998 by the Chesapeake Bay Program to perpetuate the stock and maintain existing fisheries. The fishery management plan adopts Atlantic States Marine Fisheries Commission guidelines and requirements set by the Fishery Management Plan for Tautog of 1996 (ASMFC 2017). The Delmarva stock region of Maryland, Delaware and Virginia is overfished but overfishing is not occurring (ASMFC 2017). 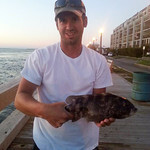 Most of the tautog fishery is recreational in Maryland. The small commercial bycatch fishery has the same size and creel limit as recreational anglers. Commercial harvesters are allowed to use hook and line, net, pot, trap, trot line, and seine.